St. Uros Cathedral in Urosevac was one the religious sites affected by the fury of protestors who caused severe damage during the violent events of March 2004. A few days ago the bells of the Cathedral sounded again, thanks to the Greek Kosovo Force’s generous efforts to reopen the Church. 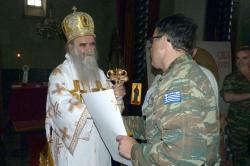 The Commander of the Greek Kosovo Force Colonel George Chatzitheofanous related to officials that on September 11th, the Metropolitan of Montenegro and the Littoral Amphilochios (Amfilohije) officiated Divine Liturgy with other Serbian Priests, and a priest from Thessaloniki. The Divine Liturgy was attended by 150 Serbians and old residents of Urosevac who left during the war, and returned a few days ago from their permanent residences in Serbia. As noted by the Greek Colonel who was present at the Divine Liturgy along with other officials of the Greek Kosovo Force and Greek policemen of EULEX, the atmosphere was overwhelming. The construction of the Cathedral of St. Uros was completed in 1933 by architect Joseph Mihajlovic. It was the largest church in the city of Urosevac. 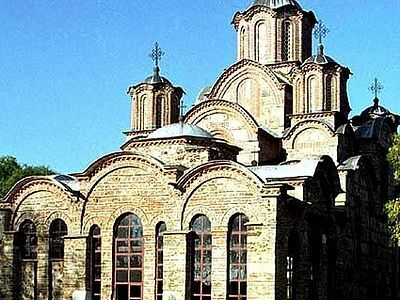 The Cathedral was built in honor of the patron saint of the city; an ancient Serbian king who became a saint. 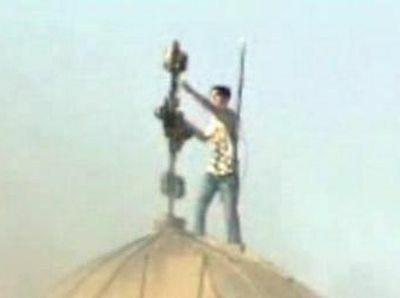 During the calamitous events of March 2004, the church was taken over by Albanian demonstrators and suffered severe damage. The Greek Kosovo Force which guarded the Church had to withdraw under extremely difficult circumstances as it could not control the civilians. The cathedral of St. Uros has been closed since that time, and become overgrown and littered with barbed wire, piles of trash dirt, and rubble. This image of abandonment was exactly what the Greek Force wanted to change, and it gained many allies and helpers in this effort. Regional bodies, the Mayor, the Imam, the Catholic Bishop and others assisted Colonel Chatzitheofanous. Additionally KFOR military priests, including an American Colonel, a Ukranian Colonel, and a German Lieutenant Colonel responded to this appeal, along with EULEX representatives and the OSCE. The brutal murder of two Serb young men and the wounding of two others on 27 August in southern Kosovo has highlighted the lack of progress in decentralizing the province, a process seen by Kosovo Serbs as key for their survival in the Albanian-dominated province.